DemoCurmudgeon: Walker borrows more while cutting taxes. What a plan. Walker borrows more while cutting taxes. What a plan. Walker Veers from Promise Not To 'Spend More Than You Have’: Walker lived up to that in his first budget, according to Todd Berry with the Wisconsin Taxpayers Alliance. But Berry said Walker's second budget is headed in a different direction starting with the next fiscal year. "We're going to spend, it looks like, more than we're going to bring in in revenue, and the reason simply is we have some big tax cuts," Berry said. The nonpartisan Legislative Fiscal Bureau projects that in year two of this budget, the state will spend $559 million more than it takes in. That number is just the general fund. To really dig into this promise, people have to look at the transportation budget. The trouble in Wisconsin is that borrowing keeps going up with no end in sight. Officials with the Fiscal Bureau said total state indebtedness is projected to grow by more than $1 billion under the governor's watch. Jon Peacock, who directs the Budget Project at the Wisconsin Council on Children and Families, said continuing this idea is the opposite of what state officials should be doing. "At a time when the economy was doing well and coming out of a recession, that's the perfect time to reduce the amount of bonding, but instead, we've increased it," Peacock said. It's not that people don't know how to fix this, but Walker has shot down proposals to raise taxes or fees to pay for roads. The Incredible Republican Voter Fraud Guy! Tea Party turns on Big Business!!! Oops. Bigger Energy Monopoly touted by Scott Walker. Free Market Failure: The Great Recession!!! 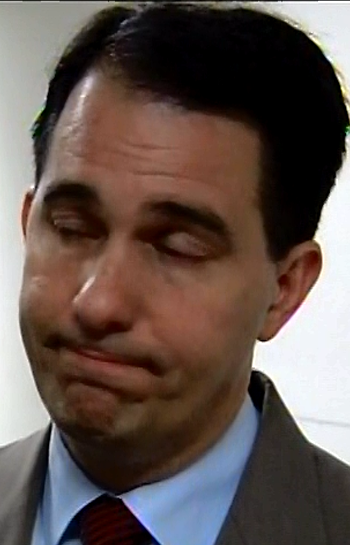 Walker's wage deficit another big Campaign issue. Good Guys with Guns Killed by Bad Guys with Guns. What's next for the Tea Party, stoning gays? The Ayn Randian Mind behind the Tea Party "Brat." Really? A "makeshift" Shooting Range? Judge Randa and Koch's picked apart again!!! Magic: Desktops with no wires! Americans won't be happy if Hobby Lobby wins.